Away from professional stadiums, bright lights, and manicured fields, there’s another side of soccer. Tucked away on alleys, side streets, and concrete courts, people play in improvised games. Every country has a different word for it. In the United States, we call it “pick-up soccer.” In Trinidad, it's "taking a sweat." In England, it's "having a kick-about." In Brazil, the word is “pelada,” which literally means "naked"—the game stripped down to its core. It’s the version of the game played by anyone, anywhere—and it’s a window into lives all around the world. 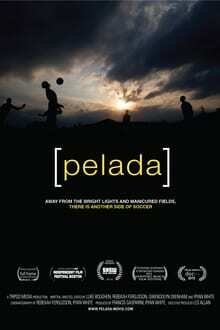 Pelada is a documentary following Luke and Gwendolyn, two former college soccer stars who didn’t quite make it to the pros. Not ready for it to be over, they take off, chasing the game. From prisoners in Bolivia to moonshine brewers in Kenya, from freestylers in China to women who play in hijab in Iran, Pelada is the story of the people who play.